It’s been soup weather lately. 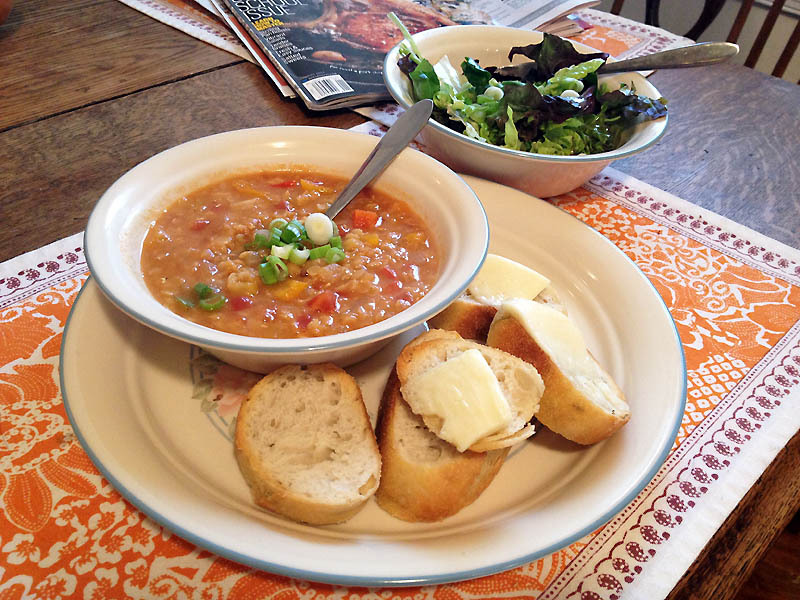 After-work walks with pup on dark winter nights make me crave hot dinners, like this Spanish Lentil Soup that comes together in a half-hour. My mom pulled the recipe from Cooking Light ages ago, and it’s one of my go-to recipes. I’m not actually sure how “Spanish” it is–oh hey Emma, what are your thoughts? (She’s the Spain expert in our family.) But, this soup is healthy, filling and fast. And of course, warm. Heat olive oil in a large pot over medium-high heat. Add onion and garlic, and saute for 2 minutes. Add bell peppers, vinegar, cumin, and crushed red pepper; saute for 3 minutes. Add tomato and salt; cook for two minutes. Add water, lentils, paprika and sofrito; bring to a boil. Partially cover, reduce heat, simmer 25 minutes or until lentils are tender. Stir in sherry, taste for seasonings and serve.